Even though Michigan is categorized as having a very low hazard risk for earthquakes, the state does experience earthquakes. Since one of the earliest recorded quakes in 1872, several earthquakes have been felt in Detroit and Michigan, especially within a strip of land along the southern border of the Lower Peninsula. The largest earthquake within the state, according to the U.S. Geological Survey, originated in South-Central Michigan in 1947, as a VI intensity and caused damage in an area southeast of Kalamazoo. Ground shake was felt as far away as Cleveland, Ohio; Cadillac, Michigan, Chicago, Illinois; and Muncie, Indiana. The rigid nature of the bedrock that runs throughout the Midwest allows seismic waves to travel across the region. The bigger the magnitude, the further away the earthquake can be felt. For example, faults within the New Madrid Seismic Zone were responsible for a series of earthquakes in 1811 and 1812 that managed to shake the ground in Michigan. The ground shakes in Detroit from those quakes was felt as a V.
1870: An earthquake originated in the Saint Lawrence Valley in between Montreal and Quebec in Canada. 1886: An earthquake originated in Charleston, South Carolina, where it registered a magnitude 7.3 and was intensity X. In Detroit, it was an intensity II-III, while in Chicago it was an intensity V.
1895: A major earthquake originated in Charleston, Missouri. 1925: An earthquake originated in the St. Lawrence River region in Quebec, Canada. It was felt in Grand Rapids as an intensity V.
1935: An earthquake registering 6.1 on the magnitude scale originated in Timiskaming Quebec. Ground shake in Mt. Clemens and Port Huron was an intensity V.
1937: An earthquake registering 5.4 on the magnitude scale originated in western Ohio, where it was an intensity VIII. 1944: An earthquake originated in the St. Lawrence River Region in Massena, New York and was felt in Detroit. 1968: An earthquake registering 5.4 on the magnitude scale originated in South-Central Illinois, where it was an intensity VII. It was felt in 23 states, including intensity I to III in Detroit and Michigan. 1975: An earthquake registering 6.2 on the magnitude scale originated in eastern Idaho, where it was an intensity VIII. 1980: An earthquake registering 5.2 on the magnitude scale originated in northeast Kentucky, where it was an intensity VII. It was felt as an intensity II-III in southern Michigan. 1983: An earthquake registering 5.3 on the magnitude scale originated in the Blue Mountain Lake area of New York, where it was an intensity VI. 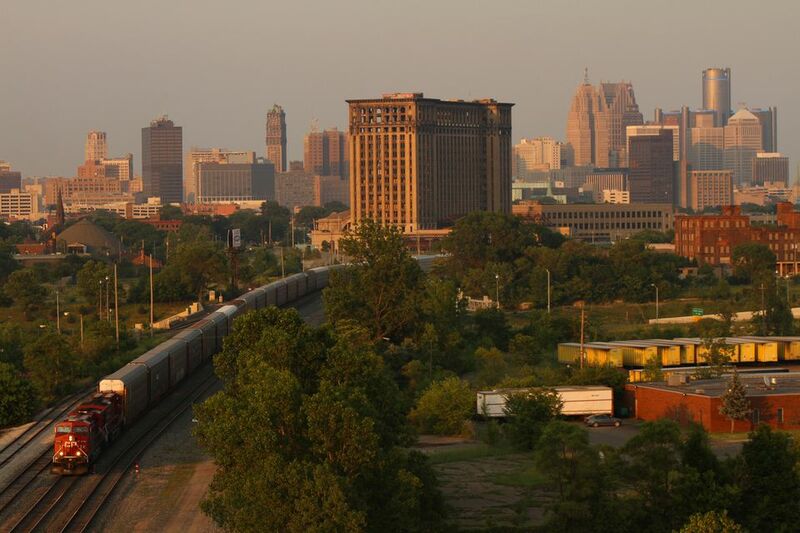 Detroit was on the outer edge of the area affected by the earthquake and experienced it as an intensity II-III. 1987: An earthquake registering 5.1 on the magnitude scale originated in Olney, Illinois. 1998: An earthquake registering 5.2 on the magnitude scale originated in Pennsylvania, just east of Cleveland. 2000: An earthquake registering 5.2 on the magnitude scale originated in Kipawa, Quebec. 2008: An earthquake registering 5.4 on the magnitude scale originated in southeast Illinois on April 18th. It was felt as an intensity II-IV at various locations in and around Detroit. There have been several earthquakes that have impacted Michigan since 2000. The most significant earthquakes to occur near Michigan in 2011 originated in Arkansas (magnitude 4.7) on February 28th, 2011 and Virginia (magnitude 5.8) on August 23rd. The Virginia earthquake was felt in various placed around Detroit as intensity II-III. A 3.6 magnitude quake centered near Amherstburg, Ontario, Canada rattled windows in downtown Detroit on April 19, 2018.